In the 22 games since this midpoint (as of Wednesday night), both teams have – as the following numbers indicate – performed somewhat worse. Clearly both teams have declined relative to what we saw after 41 games. So what’s the problem? A non-statistical approach might look at factors like teamwork, defensive intensity, and chemistry. Player statistics, though, allow us be a bit more definitive. Specifically, statistics allow us to separate a player from his teammates. And that allows us to assign responsibility for the outcome we observe. Let’s start with the Atlanta Hawks. Tables One-Two provides two perspectives on this team. Table One reports what the players for the Hawks have done across the entire season. In addition, we see what the veteran players did in 2008-09. As one can see, the story told since early in the season remains the same. Josh Smith – who has improved with respect to shooting efficiency, rebounds, assists, steals, and blocked shots – has increased his WP48 [Wins Produced per 48 minutes] from 0.116 to 0.284. And as Table Two reports, Josh Smith is even better in the second half. Since the midpoint, Josh Smith has posted a 0.305 WP48. When we look at the remainder of the roster, for the most part we don’t see substantial changes in Wins Produced. The lone exceptions are seen with respect to the production of Al Horford and Mike Bibby. It appears those two players are the most responsible for the Hawks second-half decline. Now let’s look at the Celtics. Unlike the Hawks – who have improved in 2009-10 (thanks primarily to Josh Smith) – the Celtics are winning less than their 2008-09 performance would suggest. The veterans performance in 2008-09 suggests the Celtics should have already won 52 games this season. Much of the twelve game drop-off – as Table Three indicates – can be linked to the production of Ray Allen, Eddie House, and Rasheed Wallace (three relatively old players). Since the midpoint, this decline has quickened. Again, the team has only posted a 12-10 record across the past 22 games. Virtually all of these wins can be linked to the play of Rajon Rondo, Kevin Garnett, and surprisingly, Ray Allen (who is not quite what he was last year, but is now closer). Although this trio has played well, Paul Pierce, Kendrick Perkins, and Rasheed Wallace are offering much less. One could speculate as to why we see such declines. Possible explanations include the problems of a small sample (although 22 games isn’t that small of a sample), injury, or age. The best source for such explanations should be the coaches watching the players every day. Answering the question “how productive are these players?” serves to focus the attention of these coaches. In talking to people in sports, though, one senses an unwillingness to be so focused. In other words, coaches and teammates seem unwiling to single out individual players. It simply seems easier for people associated with the Celtics to say “well, we need to do better as a team.” This approach, though, isn’t very helpful. The data suggests the problems for this team are really linked to just three players (and for the Hawks it’s just two players). For the Celtics to return to what we saw in the first half of the season it seems likely that the three players identified – and especially Paul Pierce — are going to have to produce more. Yes, Paul Pierce really deserves the most blame for what we have seen in Boston since the midpoint. 24 Responses to "Assigning Blame in Atlanta and Boston"
Has Ray Allen’s productivity dropped off faster than his age would expect? It seems like it has happened quickly the last 2 seasons. Evan, Allen’s productivity has returned to normal after a slow start to the season. From what I recall, his productivity this year is close to his productivity in his first year as a Celtic. Last year was exceptional for him. If he continues to do well in the second half of the season, his final performance will be pretty normal for him. Injuries plagued Pierce – they are responsible for his decline at the mid-way point of the season. I do not know why Perkins is performing so poorly, though. I think there may be a problem with the approach of using WP48 to identify weaknesses in lineups, somewhat akin to a dog chasing its tail. But… perhaps there is some application for it. Holy crap Jamal Crawford has become an average player! That is a small miracle, if you ask me. B. Rasheed Wallace is done. And it appears from the shape of his pudgy body that he doesn’t care. It’s sort of funny to see him play even worse for Boston than he did for us last year, all while being just as apathetic about it. The Celtics are in a tough spot with Paul Pierce. He really needs to sit out for a few weeks to get healthy, but then who is going to play SF? With Sheed, if they reduce his minutes they’re not going to be able to replace his size. I’d like to see what they could do if they gave Shelden Williams more minutes though. One thing to note– after Al Horford made the All-Star Team, he said in an interview that he could be a go-to scorer. After that interview, he’s been scoring 4 points/gm more, his blocks have decreased, and his shooting efficiency has decreased all while playing more minutes. His defensive rebounding has dropped off but his offensive rebounds have increased significantly– part of which may be the result of rebounding his own missed shots and part of which may be connected to his simply trying harder to get putbacks to pad his scoring numbers (not a bad thing unless his defense suffers, which has happened). It could be that he may be dropping his focus on post defense (seen in the box score as blocked shots and rebounding) in favor of scoring to try to get a bigger contract, as extensions for his class happen this summer. The Al Horford story — as you tell it — is quite interesting. When the season is over I will look at how many games Atlanta lost because Horford’s production decline. Perhaps a post “the cost of focusing on scoring in Atlanta” will be a good idea. I wonder if Perkins is secretly injured or maybe the refs have finally broken him. His rebounds/game (even with minutes) have dropped dramatically and his blocks have decreased since January. Speaking of rebounds, when is Doc going to give Sheldon Williams a chance!?!? He might be the team’s best rebounder. And finally, to the other Celtic fans, lets hope Pierce is healthy come May and June. 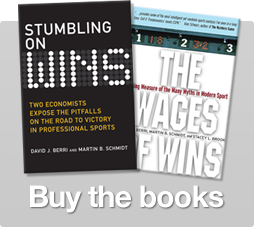 FWIW, Dr. Berri, “The cost of scoring ________” is one of the most interesting stories told in your book and this blog. It would be really interesting to hear it told in relation to Al Horford and Atlanta. With regards to both Horford and Perkins, I notice that their year-long WP48 this season is not that different than their WP48 from last season. So they played better than normal for the first half of the season and now they’re playing worse than normal for the second half of the seaons, leaving them with a “normal” performance for the entire season. Does anyone know if they had the same type of season-splits last season or if their performance more consistent over the course of the season? I don’t get to watch Atlanta very much, but I’m going to start. The rumor is that the Knicks are going to undo all the good Walsh did in getting rid of the bloated Randolph and Crawford contracts by signing Joe Johnson to a max contract. Ugggh! This smells like Allan Houston II. Al Horford apparently does not have the skill set to up his usage and remain as efficient. He would be wise to talk to Josh Smith and allow the players that can score and remain reasonably efficient to actually do it. Boston is old and hurt. If you are young and hurt there’s a shot of turning it around. If you are old and hurt you are “done”. The Celtics are done. Horford’s PPS is actually slightly higher since the all-star game. For the year he is at 1.36. Feb and March he is around 1.38. His scoring efficiency isn’t the problem. If that’s true, then I am mistaken. Thank you. I was commenting on Daniel’s assertion that his efficiency had dropped recently and assumed he was correct. Good post. This one really highlights the superiority of the systematic approach used here. Nice to see Josh Smith is still going strong too. Off-topic, I know, but the Eastern conference is getting interesting. Milwaukee continues to improve and Ty Chandler is back with the Bobcats. He had 13 points and 9 rebounds last night. Boston’s prospects for the playoffs are going to be fair if they win their division and limit the minutes of the big 3 through the rest of the season. They’ve played less than 30 the last couple of games. In what way do you think this has occurred in this instance? I read something on another blog. The purpose of that post was to find the optimum shot distribution for a given teams offensive talents. That blogger found that the optimum usage was 20-20-20-20-20. I immediately thought of your work and its main criticism. If that information turns out to be true the main criticism would be muted. I was wondering if you saw that post. Looking forward to purchasing your new book. I think I may have read that blog entry awhile back also. A balanced attack is probably preferential because it makes it more difficult for the defense to focus on any single player (or two). However, I don’t think you can generalize unless the team has 5 players with fairly similar offensive and scoring skills. That’s rarely the case. Let’s test this idea intuitively. Do you think it would make sense for the Kobe Bryant, Pau Gasol, and Andrew Bynum to each take 1 less shot per game in order to keep Derrick Fisher similarly active per 36 minutes? Do you think it might make sense for Kobe Bryant to reduce his shots to make Gasol and Bynum more active? I vote a strong yes because he’s the least efficient of the three and constantly putting up suspect shots. In fact, I think Gasol has been arguing that publicly. This blog had come to the conclusion that this was the case regardless of the offensive distribution. I don’t want to post links to anything thats not compiled data on another site though. Debilitating and still-lingering leg injuries to Kevin Garnett [knee, late last season] and Paul Pierce [foot, mid-season this year] have fundamentally altered the make-up and baseline talent level of the 2009-2010 Boston Celtics. In combination with the loss of James Posey/SF [left via UFA], PJ/PF Brown [retired], Leon Powe/PF [injured, contract not renewed] and Eddie House/OG-PG [traded], it is now safe to say that this year’s version of the Celtics bares only faint resemblance to the defensive/rebounding juggernaut which dominated the NBA just 2 seasons ago. Without a fully healthy KG and PP … 2 future HOFers … the Celtics will have zero chance of winning the NBA title again this spring, as a decidedly poor rebounding team. The Hawks W-L Record was 21-10/.677 [thru Oct, Nov and Dec], to start the season, when they played 17 teams with currently better-than-500 records and 14 teams with currently less-than-500 records. Since that point, the Hawks W-L Record has been 21-13/.618 [thru Jan, Feb and Mar 14], playing against 19 teams with currently better-than-500 records and 15 teams with currently less-than-500 records. With 9 games left on their schedule against better-than-500 teams and 8 games left against less-than-500 teams, the Hawks are still on pace to finish the regular season with 50-55 W’s, which would be a marked improvement from last year. Just like they were each of the past 2 seasons, expect the Hawks to be a tough out in the playoffs this year. I wish the Pistons would have traded for Josh Smith. Fantasy Basketball Stats Don’t Lie. How are John Wall and DeMarcus Cousins projecting out as NBA players?